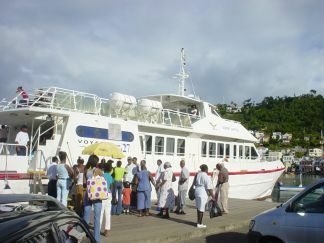 I lived in Grenada for over 21 years, and never visited Carriacou by sea, … not until the Osprey Ferry. Back in the days Carriacou by see was a adventure I could not stomach. Four hours on a wooden vessel, passage over the underwater volcano “kick ’em Jenny”, and vomit flying all over was just not my cup of tea. While in the US I heard about the Osprey Ferry, and its ability to travel Carriacou to Grenada in under two hours (ninty minutes). Now finally Carriacou by sea felt much more appealing. 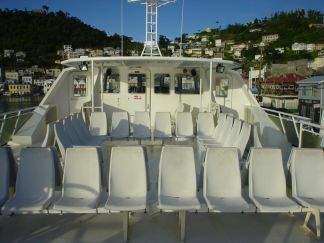 The Osprey ferry departs Grenada for Carriacou twice daily 9:00AM, and 5:30PM, and also departs Carriacou twice daily 6:00AM and 3:30PM. If you want to catch the Osprey Ferry then know this: these guys do not do Island Time. You might get lucky if boarding is slow but dont count on it. We arrived early at 8:30AM, got an easy park right next to the ferry, bought our tickets and boarded. 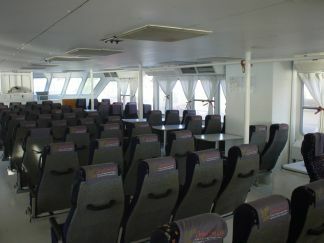 By 9:00AM everyone was on board and we were underway by 9:15AM. 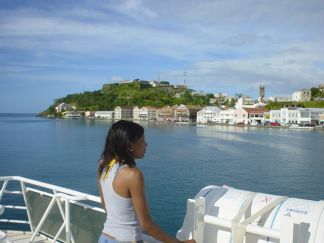 Carriacou to Grenada round trip cost us $140 per person. One way is $70 per person. For Children [12 & under] it’s $80.00 round trip and $40 one way. All rates are quoted in Eastern Caribbean currency. Note: prices may have changes since this writing, so call them for details. This was the biggest surprise for us. I certainly did not expect the Ferry to be so accommmadating. You will feel more comfortable aboard Osprey than most airlines. The lower level is the safest place to be and if you are traveling with kids you would want to make sure that they remain here. Otherwise maintain close supervision if they venture to the upper level. I saw several life vests, but none were distributed so the policy appears to be an “in case of emergency” only. 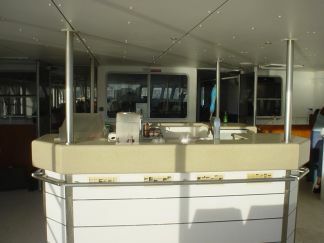 There is a small area to the stern (back) where coffee and I think beverages are sold. The carenage and the western coast of Grenada is beautiful and you can get some great photos from up top. For all the great views, the affordability, the speed, and convenience, traveling to Carriacou with the Osprey Ferry is one of the best ways to go. I travelled by the Osprey Express on 08.12.12 to Carriacou.I was very apprehensive about this after reading negative reviews of vomiting and bad weather.So I carried Gravol on board,skipped breakfast and stayed on the upper deck because I am a landlubber and very prone to vomiting .The trip was real cool.I saw Grenada’s west coast and mountains all the way to past the town of Victoria. Took shots of Gouyave from an ocean perspective.My friend and travelling companion showed me several flying fishes skimming the trough between waves and plunging into the crest. I did not try to take photographs of this because of the unpredictability.The trip was open ocean after we left the relative shelter of Grenada and the rolling ocean caused an up and down movement of the Osprey Express.My companion said that this was easy and we were lucky there was no rough ocean.Personally,if I had stayed in the cabin I would have vomited.The trip lasted approximately 90 minutes and cost EC$160. 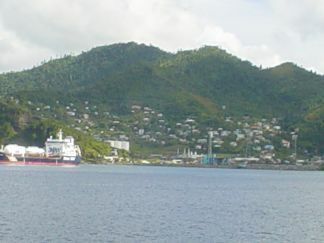 return.If you have a landlubbers stomach,follow my example and you will be fine to enjoy the trip and lovely,serene Carriacou when you dock in Hillsboro.